Yesterday, my colleague, Amit Singhal, posted about the global trends revealed in our 2011 year-end Zeitgeist. In addition to looking broadly at topics from more than 40 countries around the world, the site included the most popular local terms from more than 30 major cities in the United States. Looking at these lists, I was surprised to see that, from city to city, almost all the terms across all the lists were related to local news, education, civic services or entertainment and activities. I wanted to take a minute to take a deeper dive into these specific local trends that you won’t see published in Zeitgeist. In nearly every single U.S. city we looked at, the top ten local terms showed that people were using Google to find local news stations and learn more about educational organizations. Searches for school districts, universities and local libraries made the list in ten states, from the Hennepin County Library in Minneapolis, MN to the Chicago Public Library in Illinois. Pittsburgh, PA was the most media-hungry city in Zeitgeist this year, with all of their top 5 terms related to local news stations, while in New York City and Houston, TX, no news sources made the top ten lists. The data also showed some interesting regional differences within single states as well. Orlando, FL was a leading city in terms of education, with related terms making up 40% of the list. But in Miami, less than 250 miles away, no education-related terms made the list. While local TV station WRAL came in at the top of the list in Raleigh, NC, people three hours away in Charlotte bumped the station to their #3 spot, behind the local Charlotte Observer, which came in at #1. 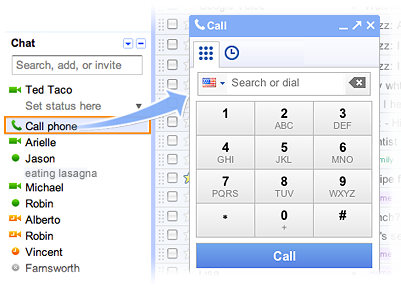 People in many U.S. cities were also using Google to connect with civic services, from the Maricopa County Assessor in Phoenix, AZ to the Cuyahoga County Auditor in Columbus, OH. We also saw many terms related to public transit and traffic, which was of particular interest to residents of Los Angeles, who put SigAlert, the California Highway Patrol’s traffic report site, as the #1 most popular local term. The city most concerned with getting out and about, though, was New York, where the top four search terms were all related to transportation, be it by subway, train or car. With national unemployment in the United States above 9% for most of the year, there was a strong interest in unemployment and finding jobs locally. The term unemployment came up on lists in Kansas City, Philadelphia and Portland, OR, and in total more than ten of the 31 cities we looked at had a term related to unemployment or job-seeking on their list. In Detroit, MI and Houston, TX, the only two cities where two unemployment-related terms made the top ten, Google searchers were also taking initiative, looking at job posting sites like the Michigan Talent Bank or classifieds like Greensheets to try and find their next job online. The local lists didn’t just reflect hard times. Nearly every city had a mall, fair, amusement park, sports team or other fun activity or destination in the top ten (the only holdout was Washington D.C.). Indianapolis, IN and Phoenix both had their respective lotteries in the number three spot—looks like lots of people there were feeling lucky! Across the country, Americans also looked for ways to relax, from restaurant week in Boston to the Lenox mall in Atlanta and Summerfest in Madison, WI. The searches people make are a fantastic pulse on what is happening around the world and close to home. We pay attention to what you’re looking for so we can come up with new and better ways to help you find it, no matter where you’re searching from. Which came first, the turkey or the hand? Creating hand turkeys remains one of my favorite elementary school memories—glue on the table, colorful feathers stuck to your sleeve and glitter everywhere. This year, you have the option to skip the actual mess involved with making these classic Thanksgiving decorations and craft a unique turkey from the comfort of the Google homepage. Whether you want to customize the headpiece, feet or individual feathers—or just prefer a random surprise by pulling on the turkey’s wing—there are many ways to show off your creativity. We can’t stick your creations on our fridge, but thanks to a collaborative effort between our engineers and artists, you’ll be able to share your turkeys via Google+ or a shortened URL. This way all your friends and family, wherever they may be, can see your festive creation. The doodle will be up from now until Thanksgiving in the United States, and you can make as many different turkeys as you like. With nearly three days to express your inner child or artiste and millions of possible combinations, you may find you unlock a surprise or two… or three… or 12! From time to time, we post about how entrepreneurs have used Google tools to build successful businesses—both on and offline. In this post, you’ll read the story of how a Utah entrepreneur used YouTube to build a market for his tongue cleaner product, the Orabrush. Starting this month, CVS/pharmacy will begin carrying the product in stores across the United States. – Ed. When Dr. Bob Wagstaff invented the Orabrush tongue cleaner, he tried all the traditional business strategies to sell his product. 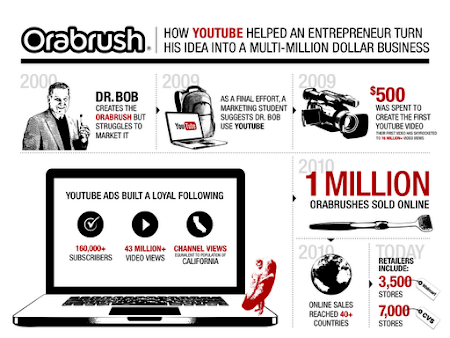 He invested $40,000 into a TV infomercial, approached retail shops to carry the Orabrush in stores and offered to sell his patent to other oral hygiene companies. None of it worked. The infomercial yielded only 100 orders, and people walked past the product in stores without a second glance. As a final attempt to get his business off the ground, Dr. Wagstaff took the advice of Jeffrey Harmon, a local college student, and started marketing the tongue cleaners on YouTube. With a $500 budget, they produced and posted their first video introducing the Orabrush and offering the product for purchase online. The quirky, commercial-style video explained that 90 percent of bad breath comes from bacteria on the tongue—hence the solution, the Orabrush tongue cleaner. Shot in a makeshift studio in the neighborhood pool hall (listen closely and you can hear the balls cracking in the background), the video went viral, rocketing to 16 million views. After the explosive reaction to their first video, Harmon took on the role as Chief Marketing Officer and began creating regular webisodes, introducing new characters like Morgan, the dirty tongue. Harmon then used YouTube video ads to reach more people and grow their fan base. The “Cure Bad Breath” videos built a loyal following, and their YouTube channel grew to nearly 40 million views. After two years, Orabrush had sold more than a million tongue cleaners to people in 40+ countries. The Orabrush brand became so popular that local pharmacy store managers began contacting Orabrush directly, citing requests from customers who had heard about the brand online. This fall, Walmart began carrying the Orabrush tongue cleaners in its 3,500+ stores across the United States. And this week, CVS/pharmacy has added the Orabrush tongue cleaner to more than 7,000 stores across the country. That’s a lot of tongue cleaners! These days Orabrush is taking a new approach to drive even more sales in stores. One of the first businesses to use YouTube TrueView video ads, Orabrush has created tailored endings to their videos that direct the viewer to the closest CVS/pharmacy carrying the Orabrush. While Orabrush may have taken an unorthodox approach, their success came from old-fashioned elbow grease, perseverance and a bit of ingenuity. Across the United States, Historically Black Colleges and Universities (HBCUs) provide educational homes for hundreds of thousands of African-American students. Small and community-focused, usually with fewer than 5,000 students, privately or publicly funded, and far-reaching in curriculum and tradition, these communities share a proud history of addressing educational equality and preparing many of the nation’s minority students for whatever life opportunities they seek. Last week, at our annual HBCU Faculty Summit in our New York City office, we had the chance to host more than 50 professors and administrators from 16 HBCUs across the country. The 2011 summit had three themes: infrastructure, curriculum and partnership. We were pleased to lead thoughtful conversations around these themes and discuss the benefits Google Apps can bring to a campus. The summit also provided a unique opportunity for representatives from different HBCUs to come together and learn from one another. Click here to view photos from the Faculty Summit. These schools joined another 13 HBCUs already using Google Apps, meaning that more than 100,000 HBCU students and faculty will have access to Google’s collaboration tools in the 2011-2012 school year.